^ 1.0 1.1 1.2 1.3 K. V. Sarma. Āryabhaṭa: His name, time and provenance (PDF). Indian Journal of History of Science. 2001, 36 (4): 105–115. （原始内容存档 (PDF)于2015-01-04） （英语）. ^ Aryabhata the Elder. history.mcs.st-andrews.ac.uk. [2012-07-18]. （原始内容存档于2015-07-11） （英语）. ^ Britannica Educational Publishing. The Britannica Guide to Numbers and Measurement. The Rosen Publishing Group. 2010-08-15: 97– [2012-07-18]. ISBN 978-1-61530-218-5. （原始内容存档于2015-09-02） （英语）. ^ Bharati Ray. Different Types of History. Pearson Education India. 2009-09-01: 95– [2012-06-24]. ISBN 978-81-317-1818-6. （原始内容存档于2015-09-02） （英语）. ^ 5.0 5.1 B. S. Yadav. Ancient Indian Leaps Into Mathematics. Springer. 2010-10-28: 88– [2012-06-24]. ISBN 978-0-8176-4694-3. （原始内容存档于2015-09-02） （英语）. ^ Heidi Roupp. Teaching World History: A Resource Book. M.E. Sharpe. 1997: 112– [2012-06-24]. ISBN 978-1-56324-420-9. （原始内容存档于2015-09-02） （英语）. ^ 7.0 7.1 7.2 7.3 Ansari, S.M.R. Aryabhata I, His Life and His Contributions. Bulletin of the Astronomical Society of India. March 1977, 5 (1): 10–18 [2011-01-22]. Bibcode:1977BASI....5...10A （英语）. ^ Cooke, Roger. The Mathematics of the Hindus. History of Mathematics: A Brief Course. 1997: 204 （英语）. 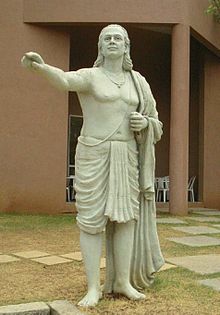 Aryabhata himself (one of at least two mathematicians bearing that name) lived in the late 5th and the early 6th centuries at Kusumapura (Pataliutra, a village near the city of Patna) and wrote a book called Aryabhatiya. ^ Get ready for solar eclipe (PDF). National Council of Science Museums, Ministry of Culture, Government of India. [2009-12-09]. （原始内容 (PDF)存档于2011-07-21） （英语）. ^ Jacobs, Harold R. Geometry: Seeing, Doing, Understanding (Third Edition). New York: W.H. Freeman and Company. 2003: 70. ISBN 0-7167-4361-2. ^ S. Balachandra Rao. Indian Mathematics and Astronomy: Some Landmarks. Bangalore: Jnana Deep Publications. 1998 [First published 1994]. ISBN 81-7371-205-0. ^ Howard Eves. An Introduction to the History of Mathematics 6. Saunders College Publishing House, New York. 1990: 237. ^ Boyer, Carl B. The Mathematics of the Hindus. A History of Mathematics Second. John Wiley & Sons, Inc. 1991: 207. ISBN 0-471-54397-7. He gave more elegant rules for the sum of the squares and cubes of an initial segment of the positive integers. The sixth part of the product of three quantities consisting of the number of terms, the number of terms plus one, and twice the number of terms plus one is the sum of the squares. The square of the sum of the series is the sum of the cubes. ^ R.C.Gupta. Āryabhaṭa. (编) Helaine Selin. Encyclopaedia of the history of science, technology, and medicine in non-western cultures. Springer. 1997-07-31: 72 [2011-01-22]. ISBN 978-0-7923-4066-9. （原始内容存档于2015-09-02） （英语）. ^ 19.0 19.1 19.2 Maths can be fun. The Hindu. 2006-02-03 [2007-07-06]. （原始内容存档于2007-10-01） （英语）. ^ New Microorganisms Discovered In Earth's Stratosphere. ScienceDaily. 2009-03-18. （原始内容存档于2015-04-15） （英语）. ^ Introduction. Aryabhatta Knowledge University. [2015-09-02]. （原始内容存档于2015-08-11） （英语）. Cooke, Roger. The History of Mathematics: A Brief Course. Wiley-Interscience. 1997. ISBN 0-471-18082-3. Clark, Walter Eugene. The Āryabhaṭīya of Āryabhaṭa: An Ancient Indian Work on Mathematics and Astronomy. University of Chicago Press; reprint: Kessinger Publishing (2006). 1930. ISBN 978-1-4254-8599-3. Kak, Subhash C. (2000). 'Birth and Early Development of Indian Astronomy'. In Selin, Helaine (编). Astronomy Across Cultures: The History of Non-Western Astronomy. Boston: Kluwer. 2000. ISBN 0-7923-6363-9. Shukla, Kripa Shankar. Aryabhata: Indian Mathematician and Astronomer. New Delhi: Indian National Science Academy, 1976. Thurston, H. Early Astronomy. Springer-Verlag, New York. 1994. ISBN 0-387-94107-X.